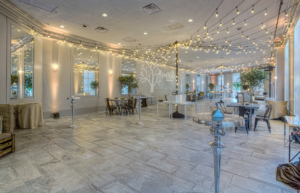 The Cobb Galleria Centre in Atlanta recently completed a major renovation of one of its event spaces, the Gallery. Complete with finely appointed décor, tile floors and dramatic floor-to-ceiling windows, this unique, 5,500-square-foot venue is well-suited for wedding receptions, corporate events, holiday parties, bar/bat mitzvahs, quinceaneras, and more. Steps away from Cobb Galleria Centre’s exhibition hall, ballroom, and meeting space, The Gallery accommodates up to 450 guests for a reception or 270 people for a seated banquet in an elegant and intimate setting with its own exterior entrance and direct access to parking. The floor to ceiling renovation includes new tile floors, fresh paint, new lighting, and refurbished doors. All of the upgrades make for an even lighter, brighter space.